I don’t know about you, but for those of us who grew up during the age of the “Cold War” find the conditions in Russia under the leadership of Putin to be frightening. 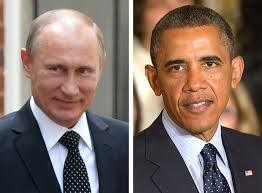 Putin is one of those personality types that seem to breed in European and Middle Eastern Countries. The same egotistical, self-centered, despots such as the likes of Adolph Hitler, Saddam Hussein, and Slobodan Milošević. I can still remember, as a child, watching Nikita Khrushchev on TV as he beat his shoe on the Podium at the United Nations, threatening to bury the united States. And, in my opinion, Khrushchev was less of a threat than is Putin. Unfortunately, the threat today is maximized because the United States does not have strong leadership. We have a president who seems to have a weak understanding of foreign policy. He does not seem to comprehend that he looks weak to the rest of the world, and in particular, to Putin. While Putin is growing his armies, and deploying large contingents of troops on the Ukraine borders, Obama is calling for a cut back in our military. The United States, militarily, is weaker that it has been in decades. The ability for the United States to defend its own borders, let alone the borders of our allies that we are morally obligated to defend due to signed treaties. I do not wish to commit one more American to the danger of serving in a foreign war. Unfortunately, that is not how it works. Our military is in serious need of bolstering, not scaling back. Obama just doesn’t seem to realize this. Our Armies are understaffed. Our Navy has half its ships not deployed, and our missile defenses are almost non-existent. And Obama wants to cut back more? What world is he living in? As I see it, the world seems to always wait to long to begin doing something about the evil in the world. Obviously the world waiting too long to stop people like Hitler, Hussein, and Milošević. Currently, there is no indication that the work leaders are willing to step up and put Putin in his place. How long should they wait? I think something needs to be done now before we have bodies in mass graves such as we saw in Germany, Iraq, and Yugoslavia. As I said in the beginning, I lived through one Cold War, I do not want to live through another. Thanks for reading and please consider, liking, sharing, and subscribing. Obummer lives in LaLa Land. He thinks all he has to do is give a speech and all is OK. If he looked back, he would see that EVERYTHING he has touched, flat blew up and is no good for the country, the people, or the world. He is an abysmal failure, traitor, actually, certainly, impeachable for not honoring his oath to uphold the Constitution, which he tromps on every week. I agree, it’s unsettling. I think that maybe the only people who see the president as weak are the conservatives. Considering the fact that Conservatives remain the largest ideological group in U.S., that is saying a lot.